Will's Wheels is an official supplier of Kinesis bikes and framesets. We hold stock of a select range of frames and are able to supply all frames/bikes in the current Kinesis range. All bikes are professionally assembled prior to being handed over to the customer. 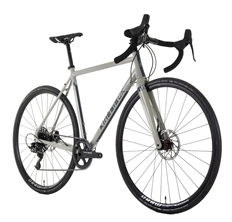 Kinesis offer a varied range of road, cyclocross, adventure and mountain bikes that excel in UK riding conditions. Their products are well made and dependable all year round; performing at a level beyond their price points. While some "off the peg" bike specs are available from Kinesis it is more common for us to build you a custom spec bike from the frame up. This allows us to work with you to produce a bike that does exactly what you want without the compromises associated with stock bikes. Kinesis bikes* are available as part of the cycle to work scheme. * Where bikes are built to a custom specification there may be a surcharge to cover the additional fees associated with bike to work schemes.